■ Job Title: Market Strategy & Brand Development (EO -SEO), Corporate and Business Collection (EO – SEO), Chief Executive Officer. 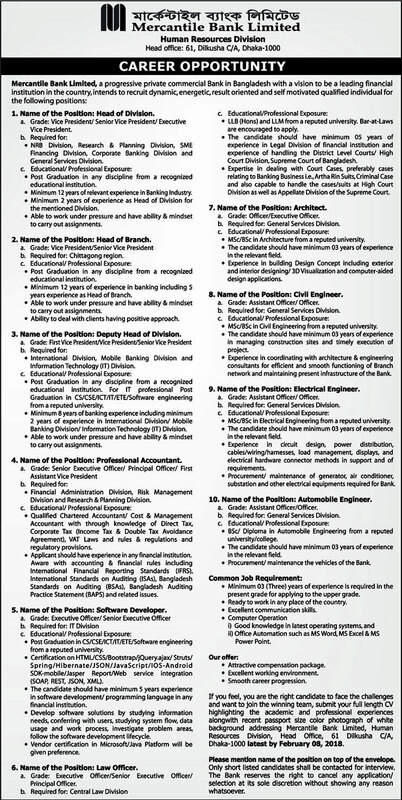 ■ Job Description: This job position is experience, talented of Collection and analyses of technical and financial proposal from the constructions firms and forward to the bank authority for further review and selection purpose..
■ Education Qualification: Master’s degree in Engineering/ Computer Science/ Telecommunication Engineering or relevant degree without any 3rd Division. Mercantile Bank reserves the right to accept or reject any or all the applications without assigning any reason whatsoever. Mercantile Bank Limited carefully manage a learning environment career development strategy smooth progression of bank talents. Mercantile Bank offer an excellent organizational culture and competitive compensation package in a way which always match our employees’ desires. Mercantile Bank Job Circular name is Project Manager. One Response to "Mercantile Bank Job Circular & Apply Process 2018"